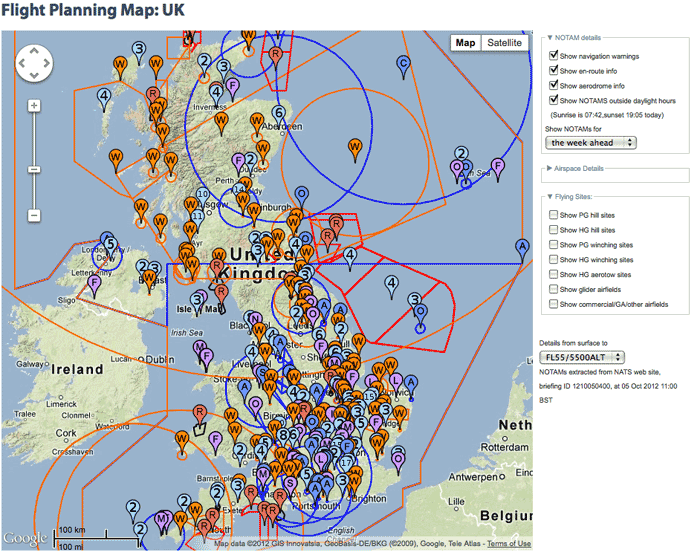 Flight Planning Map UK, This is perhaps over the top for the casual KAPper but if you have the time to check where you are wanting to fly this free service is brilliant, registering will give you extra data and set up your own preferences. Data can be filtered some much that you see above will go. Go here. Planning a KAP trip can be as detailed and as complicated as you want it to be. Behind it though there are some basic elements that need to be addressed. Remember you are launching a camera rig into the air. It is good practice to have your version of a simple checklist which should consist of some of the following considerations. Weather Conditions: Will the conditions sustain the kite and payload without causing safety issues. Equipment: Have you throughly checked all of your equipment. Once everything is up in the sky, just like a real aircraft you can't pull into a layby and check under the bonnet. Lines, clips and batteries all in good condition. Location: Is the location OK for kite flying? Do you know the site, are there any obstacles or features needed to be considered? Is it near an airport or Restricted/Military Area? Permissions: Are you wanting to fly above the promulgated legal limit? If so a permit is needed from the CAA in the UK. Does the location need a permission or permit to fly there from the landowner e.g. The National Trust? Again seek permission, sometimes in advance,sometimes on the day. 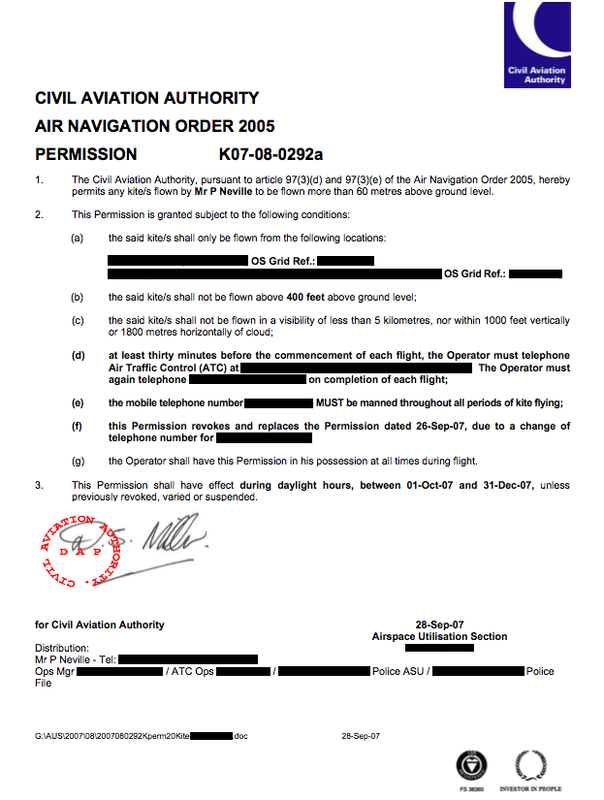 This is the permit from the CAA Airspace Allocation Unit. It has all the terms and conditions for me to fly at the location. Salford Quays, In 2008 I managed to get permission to fly at Salford Quays from what was then known as the Bronnington Car Park (see below for history). The site is now Granada Studios with the Coronation Street set among others. To fly today from this point would be impossible. Sadly my equipment at the time was inferior and the conditions were not brilliant hence the composite sky. But it is a scene that can never be recreated. The scene today is seen by millions of viewers to BBC watching current affairs programs. To see in full screen...... Click here. When the Imperial War Museum was first built one of the outdoor exhibits was a coastal minesweeper, H.M.S. Bronington, which was moored up adjacent to the museum. Through time the waste land adjacent to the museum became known as the Bronington Car Park. The car park has now become Coronation Street. I find this very ironic as there is a link. Why? Can you guess? No prizes unfortunately. Here's the reason.